2019 Volvo V60: A polite wagon with lionhearted tech. The V60 T6 with AWD starts at $44,395, including the freight charge from Gothenburg, Sweden. The Inscription tester was $49,395 with three options. 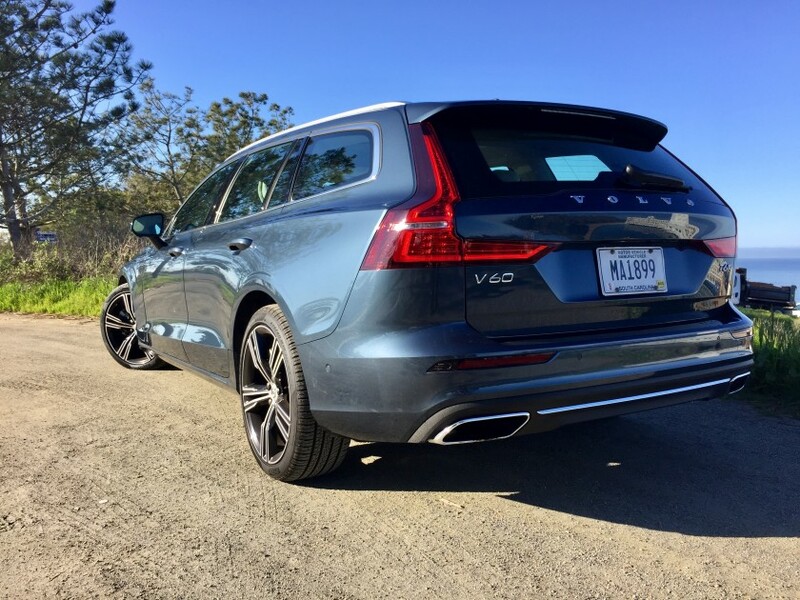 The redesigned and larger 2019 Volvo V60 wagon is a refreshing substitute for a vehicle with utility that is not an SUV but is still roomier than a sedan. The second-generation Volvo V60 wagon has been chiseled into the best-looking wagon on sale today and wired with some lionhearted technologies — not the least of which is a 316-horsepower “super turbo” four-cylinder engine. The redesign filled out its midsize dimensions, making it 4.9 inches longer, 2 inches lower and almost an inch wider on a wheelbase that is 3.8 inches longer, now at 113.1. It is sold in front- or all-wheel-drive models with two levels of “charged” direct-injection, four-cylinder engines with eight-speed automatic transmissions. Choose from three trim levels of Momentum, Inscription and R-Design. Standard Inscription features include smartkey locking and push-button ignition, panoramic moonroof, full Nappa leather upholstery, heated 10-way power front seats and driftwood inlays. The front-drive T5, starting at $39,895, has a turbocharged 250-horsepower, 2.0-liter four-cylinder engine, which Volvo says will do 0-60 mph in 6.4 seconds. Pricing includes the $995 freight charge from Gothenburg, Sweden. The T6, with AWD, starts at $44,395 and the Inscription tester was $49,395 with three options: Four-C active chassis $1,000; Bowers and Wilkins audio $3,200; and 19-inch wheels $800. The vertical iPad-like touch screen in the face of the instrument panel is reasonable for accessing everything, with a separate knob for audio volume. But making adjustments is a two-touch process, which usually takes eyes from the road. Standard Inscription features include smartkey locking and push-button ignition, panoramic moon roof, 10-way power front seats, power folding rear head rests, driftwood inlays and full Nappa leather upholstery. The T6 engine seems a little crazy with 316 hp from a supercharged and turbocharged version of the 2.0 liter. It has 295 foot-pounds of torque from 2,200-5,100 rpm, which will move it to 60 mph in 5.5 seconds. 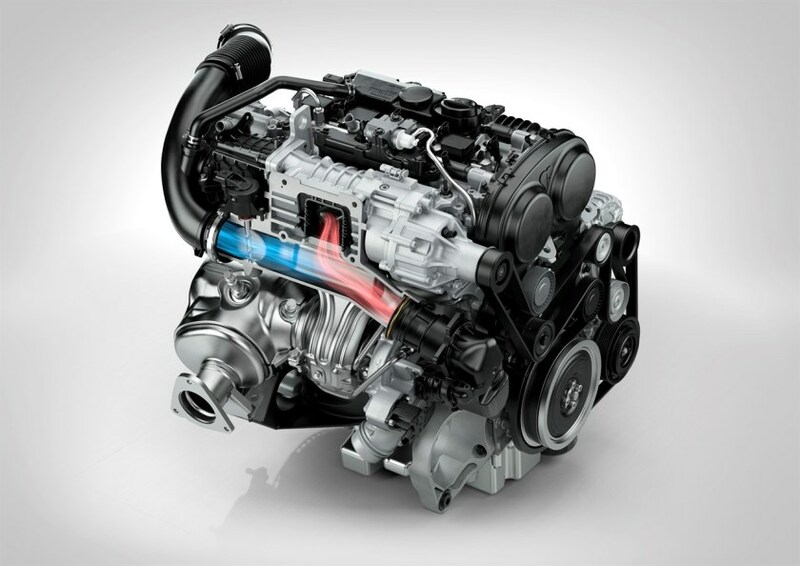 The dual “charging” of the T6 engine gives quick starts from the engine-driven supercharger, while the turbocharger carries the power into the higher rpms. But there is raspy racket on hard acceleration. The dual “charging” of the T6 engine gives quick starts from the engine-driven supercharger, while the turbocharger carries the power into the higher rpms. A stop-start at idle feature can be switched off for lead-foots who want immediate launch force from the traffic light. The eight-speed automatic has Eco and Comfort performance modes, timed to maximize fuel economy. Dial up Dynamic sport mode and the system sharpens the responses of engine, gearbox, steering and braking. I used sport mode more in traffic to keep power on point and dialed back to Comfort on the open road for more fuel economy. The advanced all-wheel-drive system gives full engagement from a standstill and then shifts to a more front-drive bias. The system constantly calculates the need for torque and can instantly redistribute up to 50 percent of the engine’s torque to the rear wheels. The V60 is no sport sedan, but it is lithe and lively to drive with a tight turning circle of 37.1 feet — an engineering accomplishment with all-wheel drive, the long wheelbase and 19-inch tires. The steering is smooth (including three weight settings) with good road feedback. And braking is confident from generously sized four-wheel disc brakes: 12.7-inch discs front, 12.6-inches rear. The optional four-corner air suspension ($1,000) links four electronically controlled hydraulic dampers (shock absorbance) that continually adapt to road conditions and driving style. You will appreciate its ability to counter head toss at driveways and speed bumps; cornering is controllable and flat. Super-turbo power is rewarding, but with AWD and a 4,202-pound curb weight there is an impact on fuel economy. The T6 AWD is rated 21 mpg city, 31 highway and 25 mpg combined on the recommended premium fuel. I was averaging up to 25 mpg with freeway driving, but my around-town mileage was in the range of 16.7-18 mpg. The 15.9-gallon tank is on the small side among the competitors, such as the BMW 3-Series, Buick TourX, Subaru Outback and VW Sportswagen. As a champion of safety, Volvo’s City Safety collision avoidance system recognizes pedestrians, cyclists and large animals. It also integrates lane-keep assist and oncoming lane mitigation, which can take over steering to avoid a front impact. Also standard are run-off road mitigation and oncoming lane mitigation. 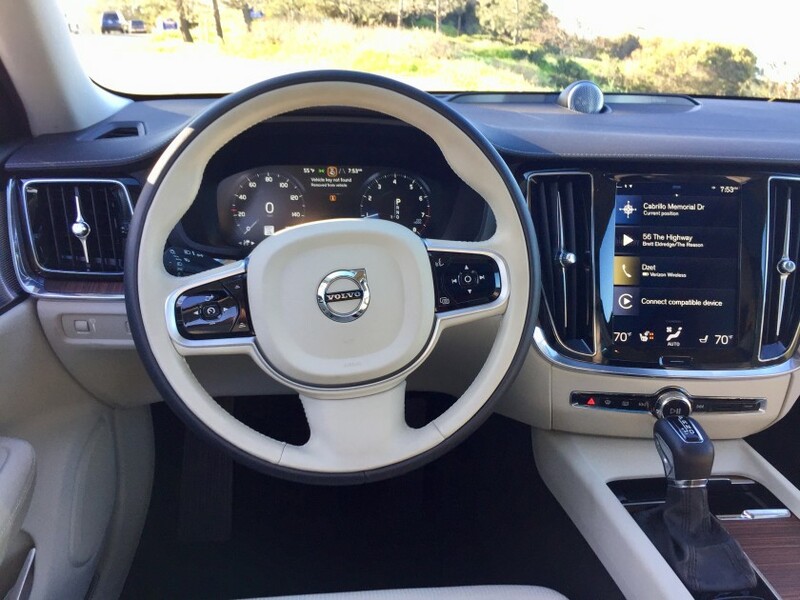 The Level 2 Pilot Assist (standard on Inscription) is a semi-autonomous driving system that will drive the car as long as the driver keeps hands lightly on the wheel. It is intended to be used on well-marked roads and works up to 80 mph. The system has been upgraded for improved cornering performance, but the lane centering is still vague. 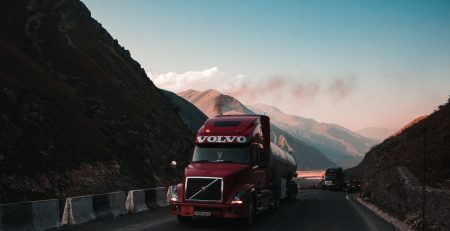 The system can be a helping hand and eyes in heavy commuting traffic, but the driver must remain vigilant because the system will shut off when light conditions or road markings are inadequate. The cabin is well soundproofed and ride quality is generally quite smooth, too. But the 19-inch Pirelli P zero all-season tires (235/40) can feel grainy on grooved concrete or coarse blacktop. The lower stance does not hinder easy entry and exit, but the cabin space might not feel as airy, for those who knew the previous V60. Headroom was cropped to 37.4 inches, including the standard panoramic moonroof. Sightlines are open at the side mirrors and over the shoulder. The orderly cabin layout has intuitive placement of controls. And even the vertical iPad-like touch screen in the face of the instrument panel is reasonable for accessing everything, with a separate knob for audio volume. But making adjustments is a two-touch process, which usually takes eyes from the road. 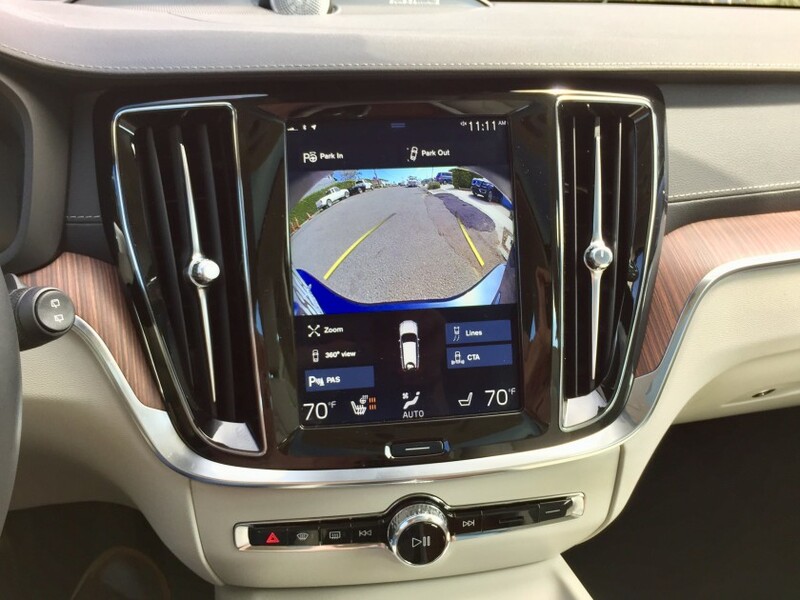 The Level 2 Pilot Assist system can be a helping hand and eyes in heavy commuting traffic, but the driver must remain vigilant because the system will shut off when light conditions or road markings are inadequate. 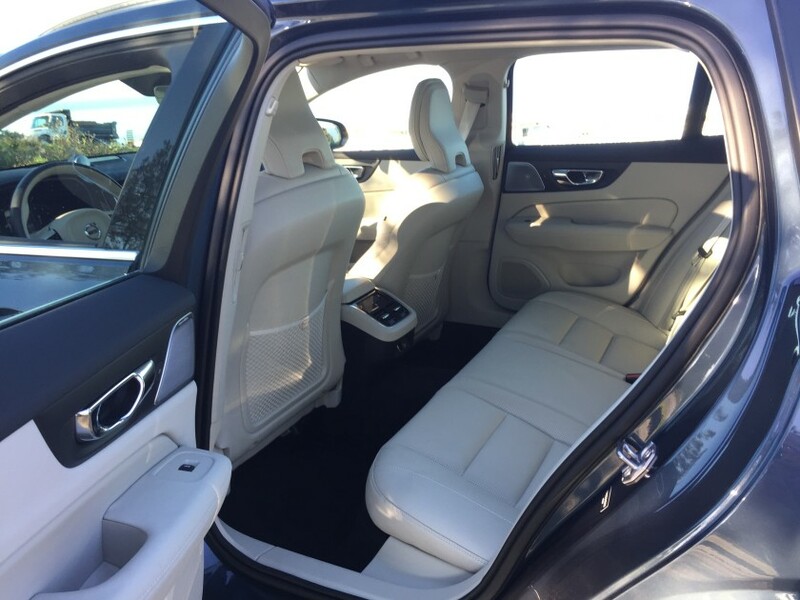 With 35.2 inches of rear legroom and 38.1 inches of headroom (more than in the front seat), there is room for 6-foot adults. 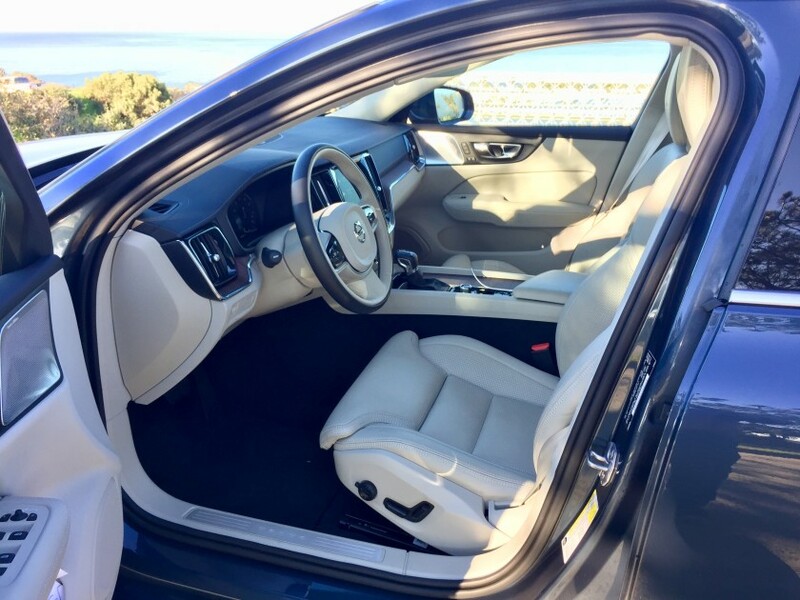 But the bench seat is not raised, so passengers ride low and the bench is short on thigh support, making it better for younger and less-tall passengers. The tall transmission tunnel also makes the back seat better for two. In Volvo’s European plug-in models, the battery is packed in the trans-tunnel space. And while there are many details, including a wide fold-down armrest with cup holders, there are no USBs, but there is a 12-volt plug. 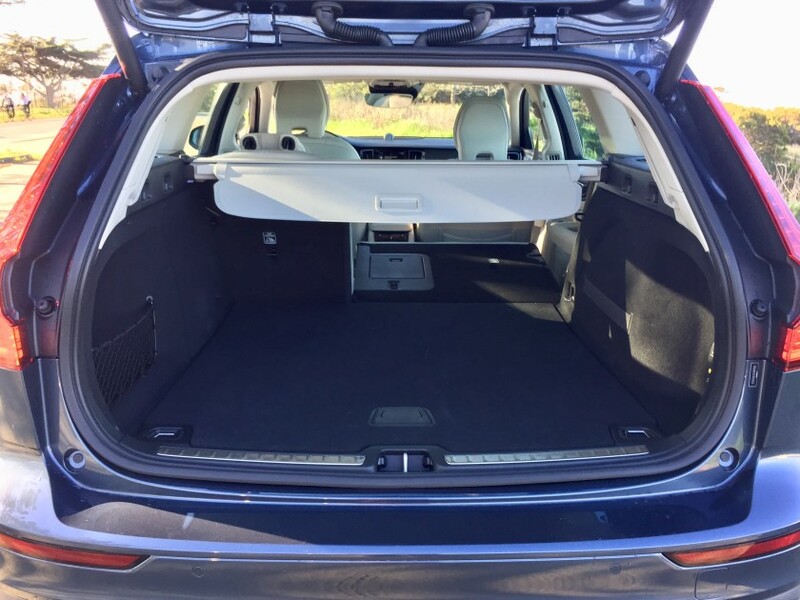 There is wide-and-low access to the 18.7 cubic feet of cargo space behind the second row. The area is well finished and includes seatback releases to fold the 60/40 seatback for a flat space with more than 6 feet of length by 43.5 inches wide and 26 inches tall at the opening. The spring-released seatbacks also drop and raise the head restraints. There is wide-and-low access to the 18.7 cubic feet of cargo space behind the second row. Volvo currently has three SUVs — small, medium and large — in the XC40, XC60 and XC90. And it has the large V90 wagon, plus a cross-country variant with raised suspension and more SUV attributes. And the V60 CrossCountry will debut soon. But wagons are at the core of Volvo. There is a genuine purity to the V60 for its Scandinavian design influences. Many European cars today are homogenized and designed to appeal to the North American market. Take away the badge on the steering wheel and often there is little inside the cabin to flavor the brand’s nationality, other than the notoriety of balky electronics. But a Volvo is a cultural immersion. What elements are wood are real. Metal trim is not foil-bonded plastic. And the full Nappa leather is not processed into vinyl-like hide. Even the graphics and typography are unique. And all of those elements appear to be assembled, polished and stitched with pride. 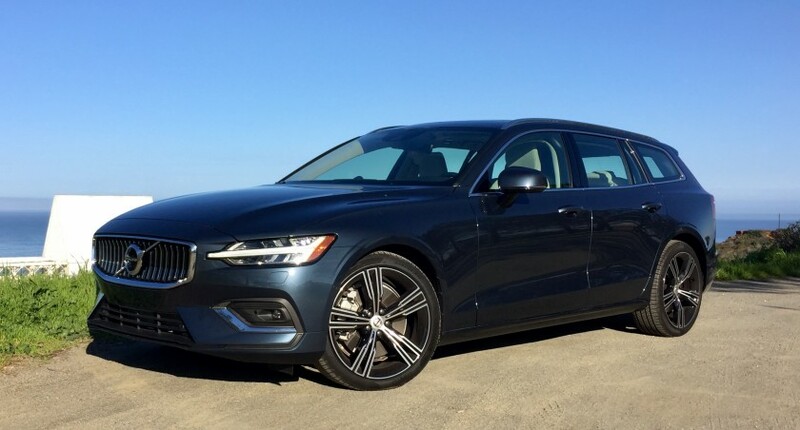 With Volvo’s high regard for safety and occupant accommodation, the 2019 V60 is a polite and considerate choice. · Body style: midsize, 5-seat AWD wagon. · Engine: 316-hp, turbocharged and supercharged, direct-injection 2.0-liter 4-cylinder; 295 lb.-ft. torque at 2,200-5,100 rpm. · Transmission: 8-spd Geartronic; w/stop-start at idle. · 0–60 mph: 5.5 seconds. · Fuel economy: 21/31/25 mpg city/hwy/combined; premium fuel. · Fuel tank: 15.9 gal. · Cargo space: 18.7-31.7 cu. ft.
· Front head/leg room: 37.4/42.3 in. · Rear head/leg room: 38.1/35.2 in. · Curb weight: 4,202 lbs. · Turning circle: 37.1 ft.
· Standard equipment includes: smartkey locking and push-button ignition, panoramic moonroof, full Nappa leather upholstery, 12.3-inch digital driver display, mobile apps, Wi-Fi hotspot, clean zone air-quality system, LED headlights with Thor’s Hammer running lights and automatic high beams, heated front seats, 10-way power front seats, power folding rear head rests, driftwood inlays. · Safety features include: 7 air bags, blind-spot warning with cross-traffic alert and automatic braking, City Safety collision avoidance (pedestrian, cyclist, large animal), lane-keep assist, oncoming lane mitigation, whiplash protection, brake-force distribution, brake assist. · Base price: $44,395, including $995 freight charge; price as tested $49,395. · Options on test vehicle: Four-C active suspension $1,000; Bowers and Wilkins audio $3,200; 19-inch Inscription wheels $800. · Where assembled: Gothenburg, Sweden. · Warranty: 4 years/50,000 miles with free scheduled maintenance for 3 years/36,000 miles. Article written by Mark Maynard.